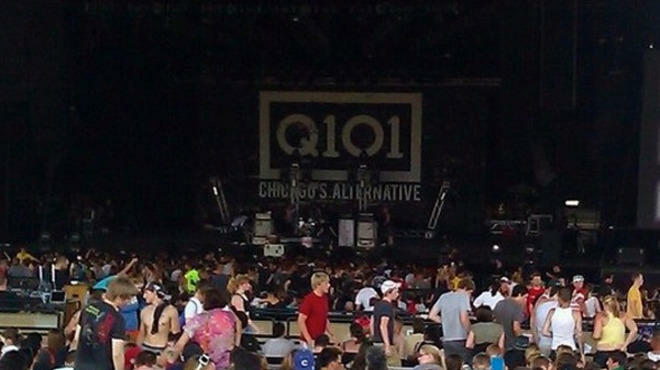 While Randy Michaels’ Merlin Media continues to assemble and train staff for its upcoming switch to an all-news format on WKQX-FM (101.1), the current roster of rock jocks at Q101 prepares to sign off for the last time. Thursday will be the final day on the air for the morning duo of Steve Tingle and Brian Sherman, Christine “Electra” Pawlak in middays, Tim Virgin in afternoons and Tim Pogo at night. The surprise wasn’t that they’re being cut (since that’s been expected since Emmis Communications announced the sale of Q101 and the Loop last month), but that they’re getting a chance to say goodbye on the air. For what it's worth, Q101 will bow out of the format with a cumulative weekly audience of slightly more than 1.1 million, according to Arbitron Portable People Meter figures for June. In the station’s target demographic of listeners between the ages of 18 and 34, it ranked ninth with a 3.9 percent share. Overall, Q101 was tied for 20th with a 1.9 share. Despite the imminent demise of Chicago’s Alternative, Merlin Media still isn’t ready to announce — much less launch — its new format for 101.1 FM. All of which should make the next few weeks immensely interesting to those who enjoy observing diversion, distraction and misdirection. That’s just what we’re in for. A key to what’s coming next could be discerned in the hiring last week of radio veteran Pete Salant for a deliberately vague role at Merlin Media. Salant’s claim to fame was as an adult contemporary programmer in the early ’80s working under then-NBC FM boss Walter Sabo, who’s now chief operating officer at Merlin. Keep an eye on him. Whatever stunting, staging and assorted mischief Merlin’s magicians perform in the interim, the company’s Chicago news chief, Andy Friedman, will continue to solidify plans for the real deal. And if CBS Radio doesn’t move quickly to protect its all-news franchise on WBBM-AM (780) by simulcasting on WCFS-FM (105.9), they can’t say they didn't see it coming: In addition to such previously identified hires as Charlie Meyerson, Rob Hart and Lise Dominique, Friedman’s latest additions include two straight out of the Newsradio 780 newsroom — anchor/reporter Debra Dale and writer/reporter Jennifer O’Neill. Fair warning: Don’t believe anything you hear for the next few weeks. But enjoy the ride.